Black Gold is a game of drilling and discovery for 2-5 prospectors, and play can last from 1-2 hours. Offering an abundance of intriguing gameplay choices and optional rules, Black Gold presents a new experience of strategy and exploration every time. The historically inspired and detailed game components, together with the tense and exciting atmosphere of warring against your fellow prospectors, will almost have you speaking with a ‘twang! Jeremy's notes: Black Gold is a solid, light/medium weight auction/bidding style economic strategy game based on the 1922 Texas Oil Boom. This game brings back that feeling for us. I really like the race for discovery of the wells and the amount of oil it will produce. The action card selection is great. Do you go for maximum travel, advance your rails for delivery, or grab deeds to win the auction? There are some agonizing decisions just in selecting which action card to grab. The storage and auction element to sell the oil is great. And the Baron’s train movement really is a great turn clock, but still have to be catious of the game end. All in all. There are great mix of cool mechanics that blend together in a cool euro-economic-race-auction game. But the real kicker besides great game play, are the bits. The oil derricks, trains, trucks and the oil splashes themselves are super cool. It really cool how the oil stacks up on your derricks. Top-Notch FFG goodness in great bits. FFG added some great variants and different game options to play, plus the different board segments can change things up too. Plus they give you an option to fix the random set up so everyone knows the exact well distribution count, if you like. It’s really scalable (but I’ve yet to play 5 player), but FFG adjusts the rules nicely for each player count. This has been our our sleeper hit of the year so far for our family and game group. I made an error with this one, i’ll admit it. What i thought i was getting was a short flowing game of oil baroning with some cool bits that i could play with the family. What i got was a long game of oil baroning that i can play with my gaming mates. 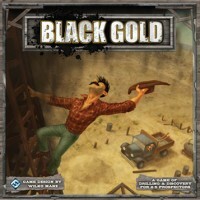 Black Gold is a good game, in fact its several games. There are a few different mechanics here to keep the game varied, some cards to show actions, exploration of the plains to search for oil and bidding to win the right to sell your oil for inflated prices. The turn goes something like – roll the dice a few times, this sets the oil prices. Then choose a card which sets the number of movement points you have, the number of bidding cards you get and may give you a special ability that round. Then you move your truck around a board in search of oil, maybe setup a rig and move your train (which transports the oil) a bit further forward. Lastly you put your oil into one of three selling companies and then all bid to be the one that sells at each manufacturer that round. This is all done whilst the oil barons train moves further towards the end of the track shere the game will end. Theres opportunity here for bluffing, haggling, strategy and screwing over your mates, a good combo. The game takes a good couple of hours and if you play it with a “ditherer”, you know the one – the sort that sit back during other peoples turns and then when its their own have absolutely no idea what they are going to do so take ten minutes thinking about it – it will be*ish. That said, amongst strategy loving, gaming friends who are working out their next move whilst you are rolling dice its a good game. And yes the pieces are very cool. Black Gold is set in 1922 during the Texas oil boom. Players take on the role of prospectors exploring West Texas in search of the most valuable oil sites. Players will explore the landscape, survey well sites, build derricks, and auction off their oil to build wealth. The theme is well represented in the game. The object of the game is to collect the most wealth before the big oil companies move in and take over West Texas. 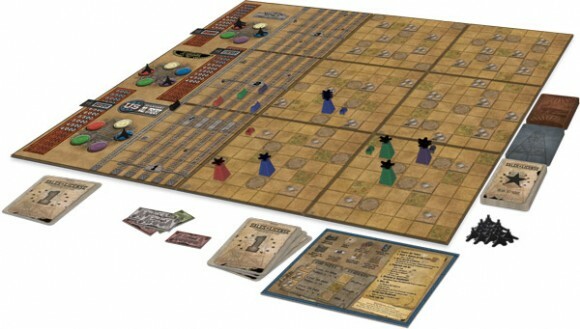 Black Gold is for 2 to 5 players ages 13 and up and plays in about 100 minutes. I would recommend Black Gold for 3-4 players. The components are generally very good. 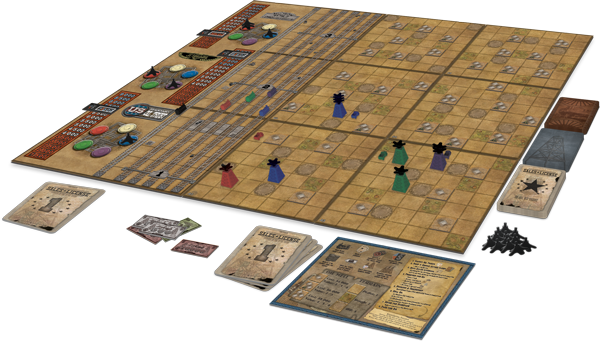 The modular board tiles are mounted on thin cardboard and have fair artwork with drab colors. There are thick cardboard tokens and plastic playing pieces. The small size linen cards are durable and have average artwork. The rulebook is 18 pages and very well written and organized, contains many examples of play, and a few pages of optional rules. Set-up for Black Gold is easy and fairly quick. Each player receives a reference sheet, their playing pieces, and $15,000 starting cash. The map tiles are arranged to form the game board, well markers are shuffled and placed on the map tiles, the oil price sliders are set to $5,000, and the cards are separated into a Sales License, Standard Action and Special Action deck, and shuffled. A few starting tokens are placed on the board and you’re ready to play! The Market Die is rolled for each oil company to determine if the selling price or going rate for oil increases or decreases. Each company’s slider is adjusted accordingly. A Special Action Card is drawn and the Oil Baron’s train moved forward the indicated spaces. The Oil Baron’s train is a game end timing mechanism. Standard Action cards equal to the number of players are also drawn. Each player then chooses one Action Card. Action Cards indicate how many Sales License Cards a player draws, how many movement points a player has to spend, and any bonus actions such as extra oil and price fluctuations a player receives. Each player receives the number of Sales Licenses indicated on their Action Card. The value of the licenses (either 1 or 2) is kept hidden from other players. The licenses will be used later during the Sell Oil step. Players in turn order spend their movement points to move their truck around the map tiles and/or move their train along the track. The train is used to transport oil to market. During this step, players can also survey well depths, build an oil derrick and/or perform any Special Action. In turn order, each player removes one oil plume from each of his operating derricks. If a player’s train is on the same row or further than his derrick, then he may transport the plume to the market for free. If a player cannot use his train, then he must pay another player $3,000 for transport or lose the oil plume. The player then places his transported oil plumes in the storage tank of any of the oil companies. In this step, players sell their oil. An auction is held at each of the three companies. The player who bids the highest value in Licenses wins the auction. The winner of each auction secures the right to sell his oil to the market. The player receives the going rate for each plume he sells. Players must dispose of excess oil at a significantly reduced price. Each company can store a maximum of 2 plumes for each player. Players receive $1,000 for each excess plume. The Market Die is passed to the player on the left. This player becomes the starting player for the next round. When the Oil Baron’s train reaches the last space on its track, the established oil companies of East Texas have arrived and snatched up the remaining well sites. The game immediately ends and the players tally their wealth. Players receive $1,000 for each plume and a bonus for each derrick depending on the position of their train (furthest along receives a greater bonus.). The player with the most cash is the winner. Black Gold is an easy game to learn and play. However, I would not recommend this game to casual gamers. The Sell Oil step is the heart of the game and is a lot of fun. If you like an auction/bidding mechanic then this is the game for you. Unlike most games where there is only one auction per round, there are three auctions per round (depending on number of players) in Black Gold. Players need to spend their Licenses wisely if they hope to make money selling their oil. This mechanic also allows players to lie about the value of their licenses, but beware the penalty if you’re caught! Outside of the Sell Oil step, there is not much player interaction. Other players can choose the Action Card you wanted or develop the well site you had your eye on. There is a moderate element of luck in Black Gold. The draw of the licenses can be one aspect. However, the big one is the draw of the well sites. The well sites can yield anywhere from 2 to 6 oil plumes. The designers must have recognized this as a problem because there are two variants which minimize the well site variance. Although I have not experienced this problem, a complaint about the game is that the luck factor could lead to a runaway winner. Black Gold is a solid, fun game with good theme play. However, because of the auction mechanic and luck factor I suggest you try it before you buy it. As usual, FFG makes great components, but the game play is what makes this game. Build your oil empire by skillfully exploring the territory and bidding better than your opponents for the rights to sell your oil for the most money. Add a Review for "Black Gold"